What can I do with the Docker container? Public Dockerhub Registry: This is the simplest setup that most docker users would be well aware of. All you need to do is set up reachability to dockerhub with the correct dns resolution. Private “insecure” registry: Some users may choose to do this, specially if they’re running a local docker registry inside a secured part of their network. Private “self-signed” registry: This is more secure than the “insecure” setup, and allows a user to enable TLS. Private “secure” registry: Set up reachability to your private registry, created using a certificate obtained from a CA. The steps used to set this up are identical to a private self-signed registry except for the creation of the certificate. We won’t really tackle this scenario separately in this tutorial due to the absence of said certificate :). Tarball image/container: This is the simplest setup - very similar to LXC deployments. In this case, a user may create and set up a container completely off-box, package it up as an image or a container tar ball, transfer it to the router and then load/import it, before running. For each case, we will compare IOS-XR running as a Vagrant box with IOS-XR running on a physical box (NCS5500 and ASR9k). They should be identical, except for reachability through the Management ports. You will notice a few directories. We will utilize the docker-app-topo-bootstrap directory in this tutorial. On the other hand, if you have an NCS5500 or ASR9k lying around (don’t we all? ), then load up a 6.1.2+ image on the router and connect an Ubuntu server (for the purpose of this tutorial), to the Management network of the router. The server needs to be reachable from the router over the Management network. Further, we’re going to enable SSH access in XR CLI and in XR linux shell to achieve an equivalence between the NCS5500/ASR9k and Vagrant setup. Note: NCS5500 steps are described, but ASR9k works in exactly the same way. Choose the size of the key modulus in the range of 512 to 4096 for your General Purpose Keypair. Choosing a key modulus greater than 512 may take a few minutes. This is openssh running in the XR linux environment. Users may choose to keep this disabled based on the kind of operations they intend to have. 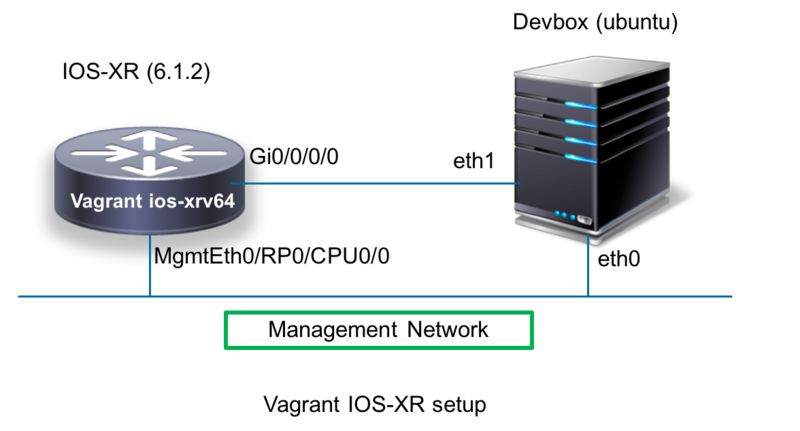 Enabling it in a given network namespace (equivalent to XR vrf) opens up port 57722 on all the IP addresses reachable in that VRF. In 6.1.2, only global-vrf (default vrf) is supported in the linux environment for SSH and apps. Post 6.3.1, support for Mgmt vrfs in the linux shell will be brought in. Save and exit (:wq in vi). This is it... if you want to bail out, you'd better do it now. Mon Mar 6 06:21:53 UTC 2017 /etc/init.d/sshd_operns: Press ^C to stop if needed. netns_identify utility is to check which network namespace a process is in. $$ gets the pid of the current shell. In the output below, tpnns is a symbolic link of global-vrf. So they both mean the same thing - XR default VRF mapped to a network namespace in linux. All XR interfaces in the default(global) vrf will appear in the linux shell in this network namespace. Issuing an ifconfig will show up these interfaces. As seen from the above output, the Mgmt port (Mg0_RP0_CPU0_0) has an IP 11.11.11.59 and the port 57722 is open all the IP addresses in the corresponding network namespace. The topology I’m using differs slightly between the vagrant setup and the NCS5500 setup. This is owing to the fact that the Management port of the vagrant IOS-XR box is used up in the NAT network. So to show equivalence between the two setups, I directly connect the Gig0/0/0/0 interface of Vagrant ios-xrv64 with eth1 of the devbox as shown in the figure below. This is the vagrant provisioner for the devbox and will install docker-engine on boot (vagrant up). Perfect! Now we’re all set with the topology and SSH access. Before we begin, let’s understand the docker daemon/client setup inside IOS-XR. From the above article it becomes fairly clear that internally the IOS-XR architecture involves a Host layer running the libvirtd daemon and IOS-XR runs as an LXC spawned using the daemon. Further, the “virsh” client is provided within the XR LXC, so that a user may have client level access to the daemon while sitting inside the XR LXC itself. The ASR9k architecture is slightly different. 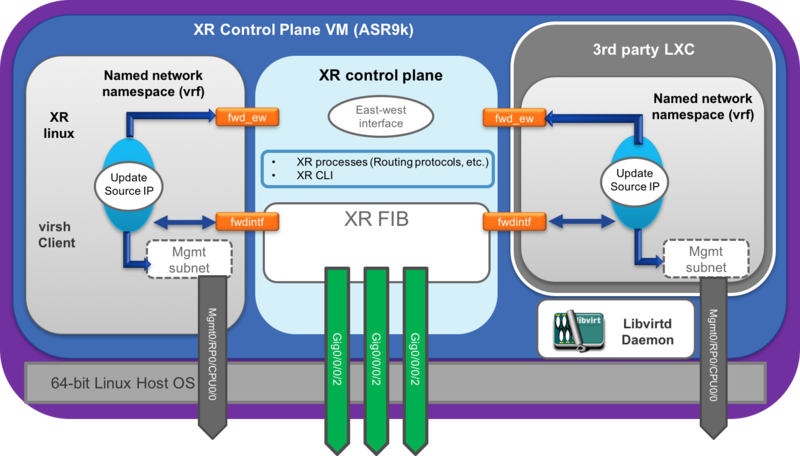 In ASR9k, IOS-XR runs inside its own VM on the 64-bit Linux host to be able to support ISSU requirements relevant to traditional Service Provider deployments. 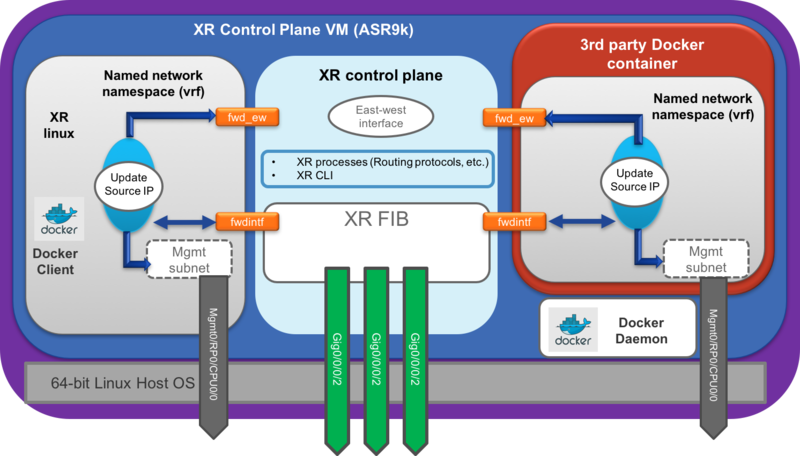 In this case, the libvirtd and docker daemons are available inside the XR control plane VM itself. This does not change the user experience from a docker client or virsh client perspective. The difference is mainly how one may interact with the docker daemon as we’ll touch upon in subsequent sections. Libvirt daemon is local to the XR control plane VM. 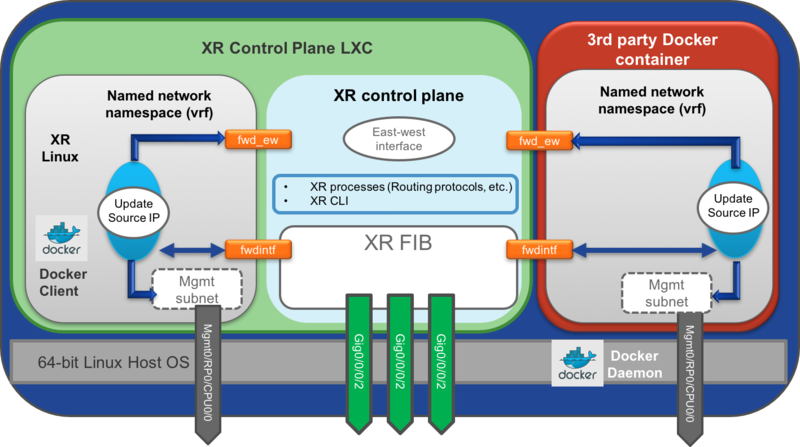 Docker daemon is local to the XR control plane VM. Alright, so can we verify this? RSA key fingerprint is SHA256:uHev9uiAa0LM36RnnxDYuRyKywra8Oe/G5Gt34OiBqk. Bear in mind that when you drop into the XR linux shell using the “bash” CLI, you are droppped in as root. This is why you can access the docker client without any hassle. For any other user, you will need to first become root (using sudo). As shown above, we become root by using -i flag for sudo to make sure the correct environment variables are sourced. Note: The steps for ASR9k are identical. NCS5500 steps are shown below. The authenticity of host '11.11.11.59 (11.11.11.59)' can't be established. RSA key fingerprint is 8a:42:49:bf:4c:cd:f9:3c:e1:19:f9:02:b6:3a:ad:01. Warning: Permanently added '11.11.11.59' (RSA) to the list of known hosts. SSH password and sudo password for user cisco will be whatever you’ve set up during the Pre-requisites stage. As discussed earlier, we’ll showcase a few different techniques through which a user may spin up a docker container on IOS-XR. This is the simplest setup that most docker users would know already. The obvious configuration necessary would be to make sure connectivity to the internet is available from the router. This may not be the preferred setup for production deployments, understandably, since direct connectivity to the internet from a production router is not typical. The next few techniques with private registries or tarball based docker container bringup might be more your cup of tea, in that case. The vagrant IOS-XR box comes with connectivity to the internet already. All you need to do is set up the domain name-server in the global-vrf (before 6.3.1, we only support the global/default vrf for the docker daemon image downloads). Remember that we’re setting up this domain name on per vrf basis. In the future, we intend to sync this through XR CLI for all vrfs to the corresponding network namespaces. Before 6.3.1, of course only global-vrf may be used. Again, become root with the correct environment (sudo -i) to execute the relevant docker commands to spin up the container. Mounting of /var/run/netns/<vrf-name>: We mount /var/run/netns/<vrf-name> into the docker container. This is an option we use to mount the appropriate network namespace(s) (one or more -v options may be used) into the container. 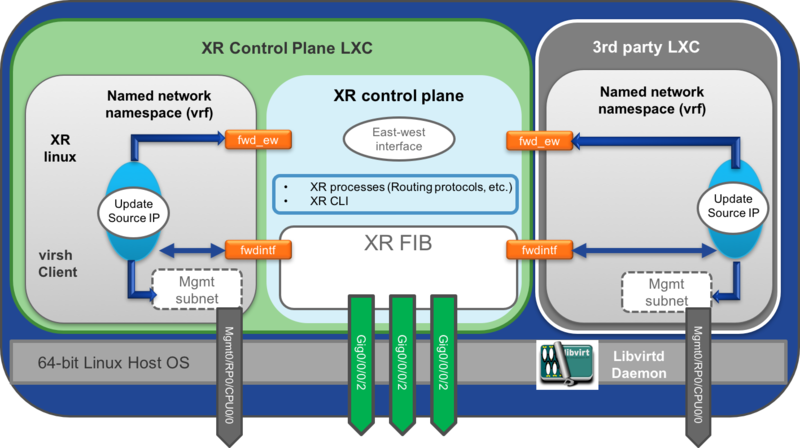 These network namespaces (XR release 6.3.1+) are created on the host and then bind-mounted into the XR LXC for user convenience. In case of ASR9k, these network namespaces are local. The docker container, running on the host (inside XR VM in case of ASR9k), will simply inherit these network namespaces through the /var/run/netns/<vrf-name> mount. Each Network namespace may correspond to a VRF in XR (CLI option to achieve this will be available post 6.3.1. Bear in mind that before 6.3.1 release only the global-vrf is supported in the XR linux shell. 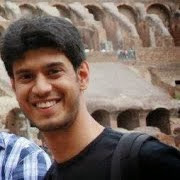 –cap-add=SYS_ADMIN flag: We’re using the --cap-add=SYS_ADMIN flag because even when network namespaces are mounted from the “host” (or XR VM in case of ASR9k) into the docker container, a user can change into a particular network namespace or execute commands in a particular namespace, only if the container is launched with privileged capabilties. Yay! The container’s running. We can get into the container by starting bash through a docker exec. If you’re running container images that do not support a shell, try docker attach instead. In order to reach the internet, the NCS5508/ASR9k needs to be configured with a default route through the Management port which is NAT-ted (using iptables Masquerade rules, not shown here) to the outside world through devbox. Note: Steps below are applicable to ASR9k as well. For those who understand the basic principle behind the IOS-XR Packet I/O architecture for Linux application traffic (see here: Application hosting Infrastructure in IOS-XR ), it might be clear that routes in the linux kernel are controlled through the “tpa” CLI. Default route through “fwdintf” : To allow packets through the front panel ports by default. Herein the update-source CLI is used to set the source IP address of the packets. East-West route through “fwd_ew” : This enables packets to flow between XR and a linux app running in a given vrf (network namespace - only global-vrf supported before 6.3.1 release). 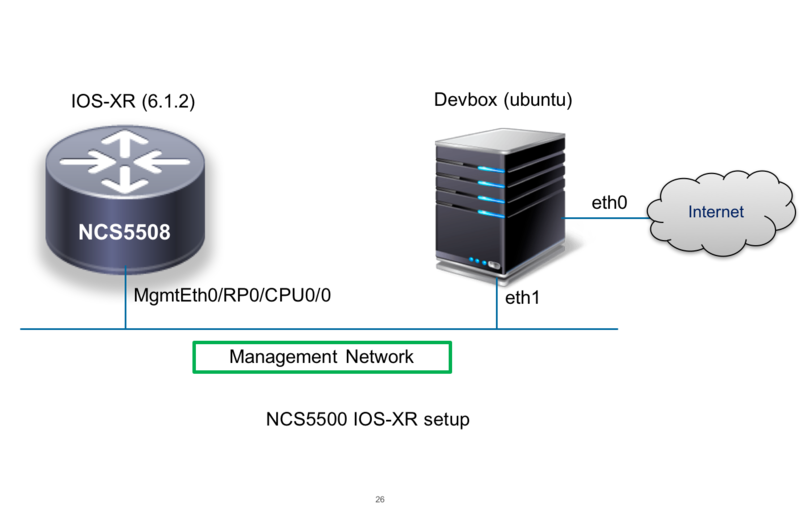 Management Subnet: The directly connected subnet for the Management port as well non-default routes in the RIB through the Management port. Post 6.3.1, the default route wouldn’t have to be set using the linux command (ip route default…). We have introduced a default-route CLI under tpa (along with vrfs, but more on that in another blog). The advantage of introducing a CLI is that it helps handle the routes in the linux kernel across reloads and switchovers as well. We spin up an insecure docker registry(which is itself a docker container pulled down from dockerhub) on our devbox. In the above steps, we’ve simply set up the registry on the devbox, pulled down an ubuntu docker image from dockerhub and pushed the image to the local registry. Now let’s set up XR’s docker daemon to accept the insecure registry located on the directly connected network on Gig0/0/0/0. Based off the config applied via the Vagrantfile, the reachable IP address of the registry running on devbox = 11.1.1.20, port 5000. # eg : DOCKER_OPTS="--insecure-registry foo --insecure-registry bar"
As the instructions/comments inside the file indicate, make sure there is a space before –insecure-registry flag. Further, in a normal docker daemon setup, a user is supposed to restart the docker daemon when changes to /etc/sysconfig/docker are made. In case of XR, this is not needed. We handle automatic restarts of the docker daemon when a user makes changes to /etc/sysconfig/docker and saves it. Further, since the docker daemon will be automatically restarted, wait for about 10-15 seconds before issuing any docker commands. Now issue the docker run command to launch the container on XR. There, you’ve launched a docker container on XR using a private “insecure” registry. The workflow is more or less identical to the Vagrant setup. In this case we’re setting up the registry to be reachable over the Management network (and over the same subnet). For this, you don’t need to set the TPA IP. If you’ve followed the steps above in the Setting up the Insecure Registry section, then you should have an insecure registry already running on the devbox environment, along with a “pushed” ubuntu image. We won’t be leveraging the tpa setup for the fwdintf interface (meant for reachability over front panel/data ports) and instead just use the local management network subnet (11.11.11.0/24) for reachability to the docker registry. Further, much like before, set up /etc/sysconfig/docker to disregard security for our registry. When you make the above change,the docker daemon will be automatically restarted. Wait for about 10-15 seconds before issuing any docker commands. Now we can issue a docker run (or docker pull followed by a docker run) to download and launch the docker ubuntu image from the registry. The ASR9k setup for an insecure docker registry is slightly different from Vagrant IOS-XR or NCS platforms. There is no automatic mechanism to restart the docker daemon. The user must restart the docker daemon once they modify the /etc/sysconfig/docker file. Again, we’re setting up the registry to be reachable over the Management network (and over the same subnet). For this, you don’t need to set the TPA IP. Important: For the ASR9k, you need to restart the docker daemon for the above config change to take effect. All we have to do get out docker daemon on the router working with the self-signed docker registry is to make sure the certificate is available in the right directory: /etc/docker/certs.d/ in the XR shell. Create a folder named devbox.com:5000 under /etc/docker/certs.d. Another way to do this would be to edit /etc/netns/global-vrf/hosts file and then change into the network namespace for the subsequent scp to immediately work. Here, 11.1.1.20 is the IP address of the directly connected interface of the devbox on the port Gi0/0/0/0 of the IOS-XR instance. Perfect. Now wait about 5-10 seconds as the certificate gets automatically sync-ed to the underlying host layer (remember, the docker daemon is running on the host). The setup of the self-signed registry is already covered above in the Setting up a Self-Signed Docker Registry section. Hop over to the router and issue the “bash” CLI. Warning: Permanently added 'devbox.com,11.11.11.2' (ECDSA) to the list of known hosts. This is the potentially the easiest secure technique if you don’t want to meddle around with certificates on a docker registry and potentially don’t want a registry at all. As a first step, on your devbox create a docker image tar ball. You can either pull the relevant docker image into your devbox (From dockerhub or some other private registry) or build it on your own on the devbox (we will not delve into this here: for details: https://docs.docker.com/engine/getstarted/step_four/). Once you have the image locally, issue a docker save to save the image into a loadable tar-ball. Login to your Router (directly into the shell or by issuing the bash command in XR CLI). We first scp the docker image tar ball into an available volume on the router and then load it up. A lot of times you might create a tar ball from a custom Docker container on your server (devbox) and would like to run the custom container directly on the router. This technique explores that option. As a first step, on your devbox spin up a docker container from an image you’d like to customize. 0 upgraded, 4 newly installed, 0 to remove and 8 not upgraded. Need to get 586 kB of archives. After this operation, 1808 kB of additional disk space will be used. Selecting previously unselected package libatm1:amd64. And there you have it! We’ve successfully tried all the possible techniques through which a docker image can be pulled into the router before we spin up the container. As a user you might be wondering: What can processes inside the spun-up Docker container really do? The answer: everything that a native app/agent (running inside the XR process space) can do from the perspective of reachability and binding to XR interface IP addresses. You basically have a distribution of your choice with complete access to XR RIB/FIB (through routes in the kernel) and interfaces (data and management) to bind to. We’re running the steps below on an NCS5500. But the steps are the same for a vagrant setup or for ASR9k. If you remember, every docker run command we have run till now involves mounting the relevant network namespace into the container under /var/run/netns. Awesome! The entire XR routing stack is your oyster :). Let’s test this setup out quickly. If you remember, we installed python as part of the ubuntu_iproute2 custom container creation. We’ll spin up a python HTTP web server inside the docker container and see if we can reach it from the outside. Success! It all works as expected.